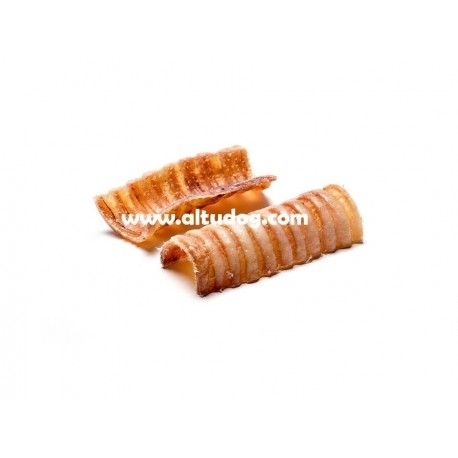 PACK 6 TRACHEAS - 100% natural dental snack - Wagyu beef trachea from animals raised on our farm in Burgos with natural feed without antibiotics, dehydrated at low temperature to preserve its properties. The wagyu beef trachea is an ideal food supplement to the diet of your dog. Natural source of Glucosamine and Chondroitin, very beneficial for joints. Especially rich in collagen providing good quality proteins. Anti-inflammatory action, beneficial for rheumatic diseases. It helps in the regeneration of tissues, and in their healing. It is also a bite with which your pet will stay entertained for a long time, enjoying its exquisite flavor. The action of chewing it has positive effects in the oral cleaning, eliminating bacterial plaque and preventing the accumulation of tartar. It also strengthens the teeth and massages the gums. Low-fat snack and easy to chew. Suitable for dogs with an alimentary sensibility or allergies. Delicious and lasting.